One common option is to order second sheets that typically only include the logo from your full Letterhead without address and other contact information. Use the Letterhead with the full details for the first page of correspondence. Logo-only second sheets are also great for internal communication. 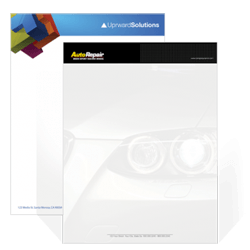 To get second sheets, place a separate order for Letterhead with just the logo graphic . Make sure to order the same stock and printing method.